To install Windows Server 2008 on your Computer or Laptop thier are some requirement to run your Server Smootly Like Processor Speed, Memory, Disk Space and other requirements like Internet Access etc. STEP 1. Insert your DVD of Windows Server 2008 into your DVD drive. STEP 2. Reboot the computer and Press F12 or open your boot screen and select CD/DVD Rom. STEP 3. 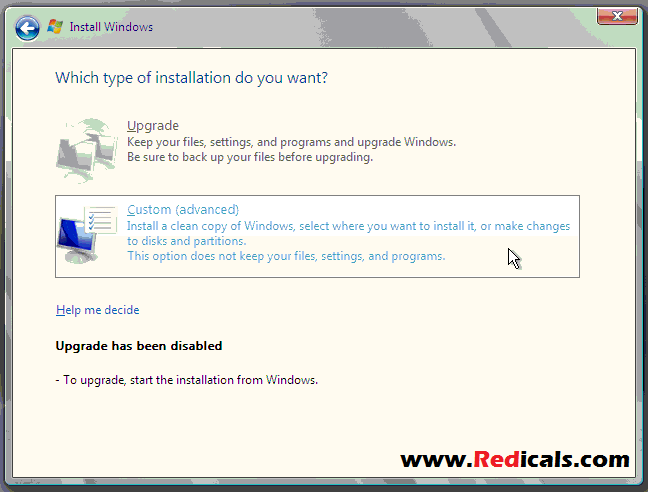 When prompted for an installation language and other regional options, make your selection and press Next. STEP 4. Next, press Install Now. STEP 5. Enter your Product Key in the next window. Click Next. If you do not have the Product Key available right now, you can leave the box empty and click Next. You will need to provide the Product ID later, after the server installation is Completed. STEP 6. 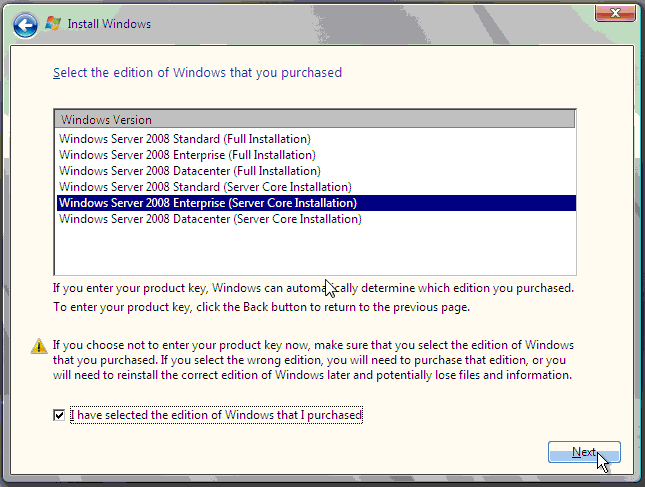 Select the edition of Windows Server 2008 and click the Next button. STEP 7. 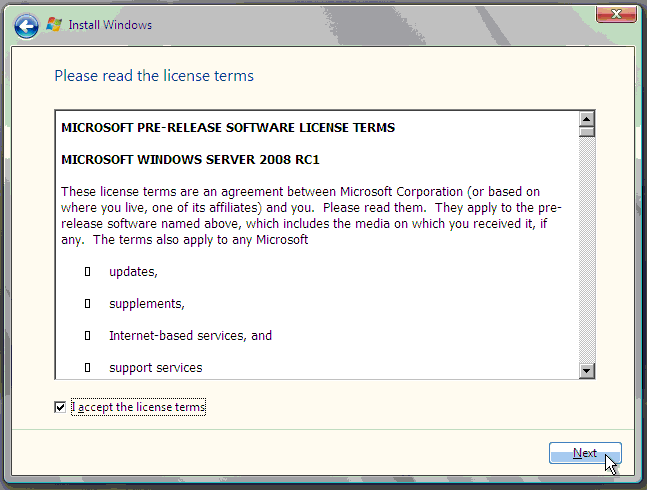 Read and accept the license terms by clicking to select the check box and press Next. STEP 8. Now click Second option—Custom (advanced). STEP 9. 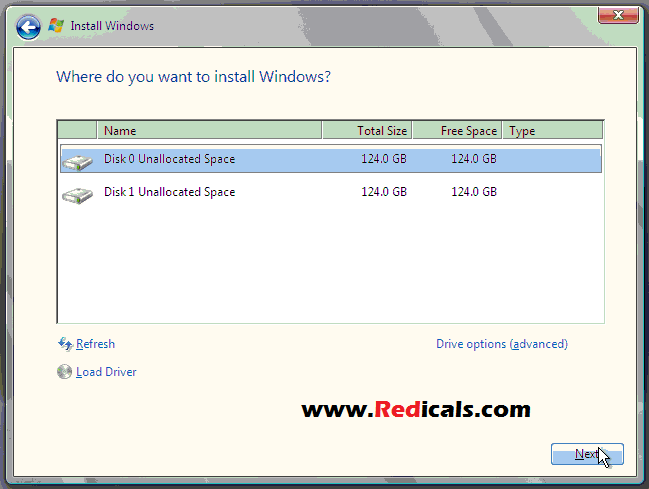 Now select the first disk, usually Disk 0, and click Next. STEP 10. When the installation begins, it will first copy the setup files from the DVD to the hard drive. It will then extract and uncompress the files and then install Windows. Depending on the speed of your system, this may take 30 minutes or longer. When the installation is complete, the computer will reboot. STEP 11. 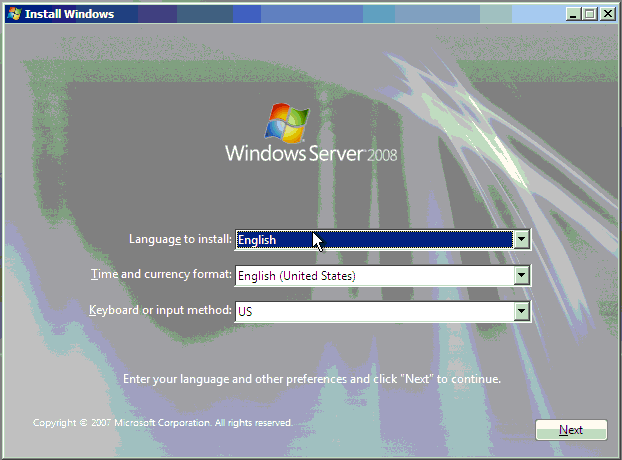 When the server reboots, you’ll be prompted with the new Windows Server 2008 R2 type of login screen. Now Press ALT+CTRL+DEL to log in. STEP 12. Click on Other User. The default Administrator is blank, so just type Administrator and press Enter. STEP 13. Now Change the Password, Just leave the default password blank and enter a new, Click OK. STEP 14. Now Goto Start and Switch User and Click on Administrator and type Your Password, Now you will be getting initial server configuration. STEP 15. Now you have Sucessfully Installed Windows Server 2008 on your Computer. If you enjoyed the content please share it with your friends and followers. If you are having any doubts please feel free to ask them by using the comments section below.